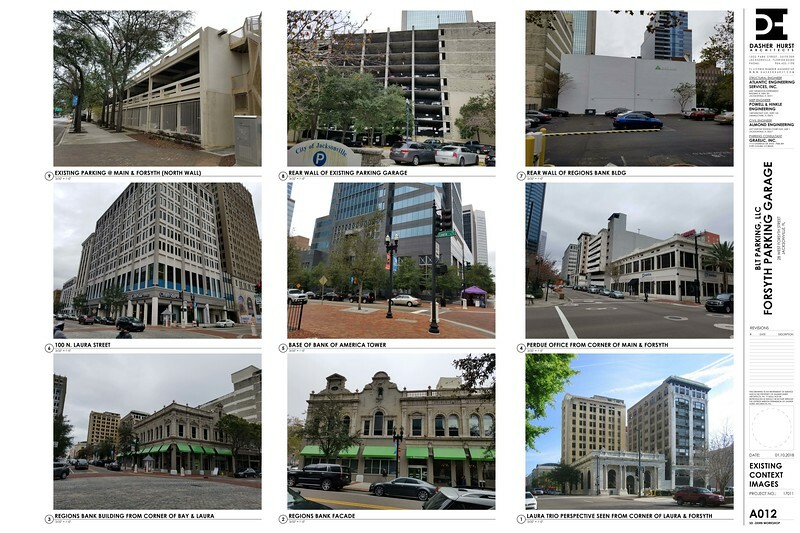 A block long surface parking lot in the heart of Downtown Jacksonville could soon be replaced by a six-level parking garage with street level retail space. 2018 is shaping up to be a magnificent for the revitalization of Downtown Jacksonville’s Laura Street. In Fall 2017, construction started on the conversion the 18-story Barnett Bank Building into a mixed-use project featuring 100 apartments and 50,000 square feet of retail. In addition, the Barnett will possibly be joined by the adaptive reuse of the Laura Trio buildings into a Courtyard by Marriott and 100 West Bay into a Hotel Indigo. 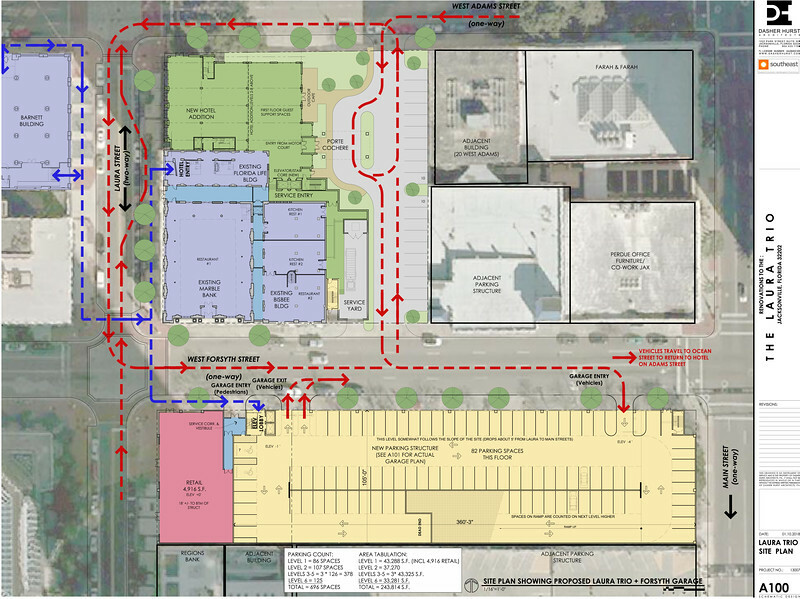 Proposed garage site plan and circulation relationship to proposed Barnett and Laura Trio projects. Now SouthEast Holdings, LP and The Molasky Group of Companies are teaming up to turn a 1.03-acre surface parking lot on the block between the proposed hotels into a parking garage and retail space. Designed by Dasher Hurst Architects, PA, the parking structure is being built for the Barnett and Laura Street Trio projects, as well as public city parking. Proposed west (Laura Street) garage elevation. Located at 28 West Forsyth Street, the six level parking garage will have 696 parking spaces and 5,000 square feet of street level retail. 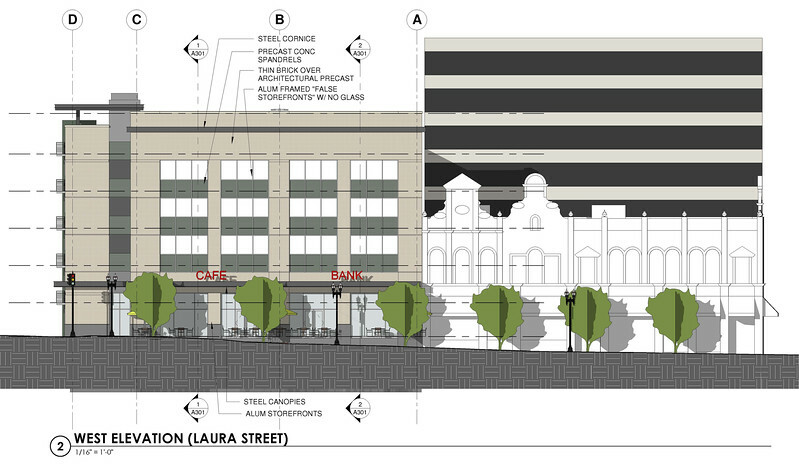 Due to an agreement with the Downtown Investment Authority, the 70 foot tall garage will have retail on the Laura Street side only because the city believes it is the most important street for pedestrian activity. Construction on the Forsyth Street garage is expected to start in April 2018 and be completed by December 2018.